We don't call ourselves a "mall" for nothing! Our goal is to carry everything to satisfy your playground shopping needs. With over a thousand products (and growing) in our store, we are the leaders in providing the largest selection of quality playground equipment at great low prices online. From the complete Swing Sets & Kits to the smaller Swing Set Accessories and Playground Hardware that go into making a swing set that will bring lasting fun, joy and memories to your family -- we believe in offering choice to our customers, all the while still maintaining high standards for quality. It all started in 1989 when parents Glenn & Lori Stockton bought a swing set for their kids. This began their mission of bringing the joy of Swinging, Sliding, and Climbing to families across the globe! It's playing outside, laughing, and having fun that brings families together, and that's why we're in this business — because we value family togetherness. Over twenty-five years later, the business is still family owned and run. In 2008, Glenn & Lori brought in their son-in-law Andrew St.Hilaire to learn the trade and help grow the business. Eight years later, they sold the business to Andrew, and today the company carries on the same original mission and builds upon its family-focused foundation. Learn more about our company history and fun staff. It is our intent to provide the lowest prices anywhere on the items we sell. Just another reason why SwingSetMall.com truly provides one-stop shopping. 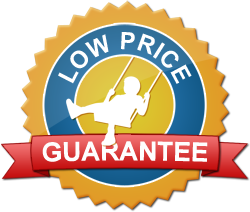 If you find a lower price before you place your order or within 30 days of your purchase on ANY ORDER at SwingSetMall.com, we will match the price! See our Low Price Guarantee page for full terms and conditions. For your peace of mind, we offer a 30-Day Money Back Guarantee on all the non-custom playground parts & accessories we sell. If you are dissatisfied for any reason with the products you receive, items are fully refundable (less shipping) if returned in new, unused, re-sellable condition. See our Money Back Guarantee page for full terms and conditions. You can shop at SwingSetMall.com with confidence. We have partnered with Authorize.Net, a leading payment gateway since 1996, to offer safe and secure credit card and electronic check transactions for our customers. The company adheres to strict industry standards for payment processing, including: 128-bit Secure Sockets Layer (SSL) technology for secure Internet Protocol (IP) transactions; Industry leading encryption hardware and software methods and security protocols that provide the best possible protection for sensitive customer information; and Compliance with the Payment Card Industry (PCI) Data Security Standard. For more, visit our Site Security page. For more information about shopping with us, check out our Shopping Policies page. If you have any questions or comments concerning our Terms and Conditions, please do not hesitate to Contact Us. We know that you have many options in online shopping. 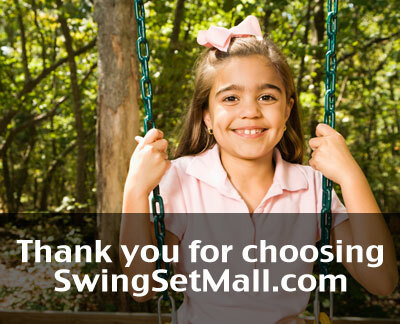 We thank you for choosing SwingSetMall.com!